About 3,000 salt bins across Devon are being refilled by the county council. Freezing temperatures are continuing and the Met Office has issued a warning for snow across the county on Thursday and Friday. Devon County Council said the operation to replenish 400 tonnes of salt was being done as quickly as possible. So far this winter, it has already used about 7,000 tonnes on the county's 2,000-mile road network at a cost of more than £350,000. 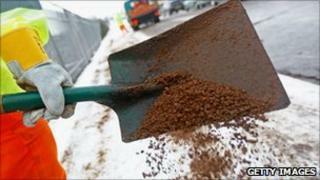 The council said salt bins were provided to enable communities to salt roads and pavements it could not treat. It has urged residents to work together to ensure there is enough for everyone and reminded people the salt bins should not be used for private land or driveways. Council spokesman Stuart Hughes said: "Filling so many bins in a county the size of Devon is a huge undertaking. "It's disappointing that we've had reports of some grit bins being completely emptied by people who are not using it on the public highway." Mr Hughes said there have also been reports of council staff being verbally abused when re-filling the bins. "People should think of others who may also need to use the salt when they help themselves." The council said it still had 18,000 tonnes of salt in stock, with another 5,000 tonnes on order.